If a user closes the browser or didn't settle the payment after being redirected to the Payment Page, this will be logged as an Incomplete Payment. It will only be posted as a valid submission if the user completed the payment and was able to completely process the transaction. 2. Select and highlight the form by clicking it. 4. 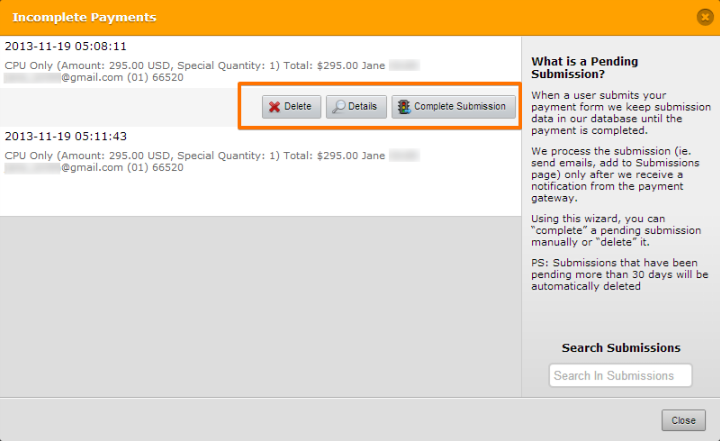 On the form's submissions page, you will see an INCOMPLETE PAYMENTS button just below the title of your form. 5. Clicking the INCOMPLETE PAYMENTS button will open the list of pending submissions on your form. You may choose to either DELETE it, view its DETAILS, or COMPLETE THE SUBMISSION. NOTE: Completing a submission will NOT process any payment as there was no payment information to begin with. The system will simply treat this as a regular submission so it can be included on form reports, and that email alerts can be fired off as usual. What is Jotform's notification URL? If I type that into the IPN on my PayPal account, will that help? There's been a disconnect between my PayPal and my Jotform, and I'm at a loss. Where do you see this now in the newer submissions form? I have two incomplete payment submissions but a check has shown up paying for both submissions but it has been more than 30 days since the form was submitted. Is there some way to reactivate the submission and then mark it paid? I do not use PayPal, I use Square. Is this option not available to me? I have done this in the past. However, for some reason it will not allow me to do so now. The number of incomplete payments is not registering as over the icon button. Any other suggestions? So this wont charge the customer. We have to contact them and have them do it again? Please tell me how to view a list of all payments that failed that I hit "complete". I didn't know what this was and just cleared about 5 of them but didn't realize their payments didn't go through. Is there a way to access all the ones we manually deleted? Why is this feature not available anymore? I would like to be able to export all the Incomplete Payments posts to excel or .csv - is that possible? all my registrations are sent to the pending submissions. I have to manually complete the submission, even though a payment has been made on paypal. i 'saved product' in the produce wizard but never got a confirmation that the integration was complete. please assist. thank you. We are a very small Association with a couple of hundred members. We get two or three 'Membership Applications' a month. Both suggestions of dmichaels (the notification) and cfnavyleague (the fresh link) would be very helpful and necessary, I hope you will have the chance to develop these. How does this work. When they click submit it re-directs them to the paypal payment page where they login and pay. What does incomplete mean and unless I go and check the form it does not notify payments are waiting. What happens if i click complete payment? Trying view submissions...marked them as read. What happens if I do a manual override and "complete submission"? If the person has entered credit card information does it charge their account, or does it accept the form without payment? We've had checks mailed and would like to have some of the forms moved from "incomplete submissions" to complete but don't want to charge the person again. I had over 10 incomplete submission forms on my boot camp registration form. when i remove the payment option and just allow it to be a form of those submission are now gone and i can find them. Also needed: a way to send a fresh link to the visitor so they can complete their payment, posting back to JotForm, automatically completing the submission. Not exactly "Set it and Forget it". What this needs is an automated "exception notification". Pending the transaction is certainly correct; the problem is not telling anyone about it (unless they browse ALL their forms EVERY day - which of course is terrible). You could require that we set up an "Exception Notification" email when we create our other e-mails. Then we'd either direct that email to ourselves or fire it right back to the user, telling them that their transaction is incomplete "try again".